Loyola week may be our version of homecoming week, but I believe it symbolizes much more. 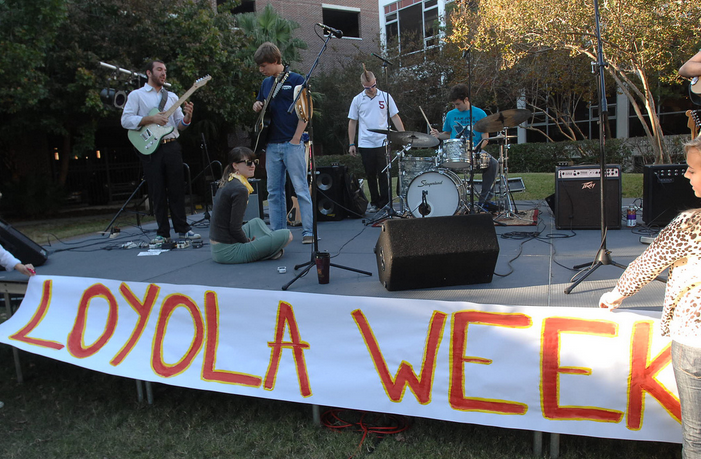 Throughout the hustle and bustle of the events in the quad and throughout campus last week, I was able to reflect on the meaning of Loyola week. Community, diversity, professionalism, and many other words describe Loyola, but I believe that Loyola week can be best represented by our Jesuit identity. Jesuit ideals may appear daunting and scary from the outside, but I see them embodied in actions of Loyola community members every day. When a professor extends her office hours to wait for a student struggling in class, two Jesuit ideals are present—critical thinking and effective communication, and appreciation of things both great and small. When a student litters, another student quickly throws the garbage in the trashcan, regardless if a janitorial worker is in the vicinity— respect for the world, its history and mystery is present. When a student chooses to wake up at 8 a.m. on a Saturday morning to volunteer and serve a person in need— special concern for the poor and oppressed,commitment to service, and finding God in all things are present. Last week, Loyola hosted multiple events including Jesus on Trial, Cookies with Catholics, Shell shocked: A documentary about growing up in the Murder Capital of America, Dear Loyola photos, and the Ministry of Presence: Being With At-Risk Children. The events offered students opportunities— opportunities to attend, to engage, and to exemplify Jesuit ideals in their everyday life. Do you exemplify Jesuit ideals in your everyday life?